The large dark areas on the moon are called maria (seas) and were formed 4 billion years ago by upwelling of basaltic magma. The craters have been formed by impacts from solar system debris, mostly in the early years of our solar system. The moon is thought to have been formed out of the molten Earth by a grazing impact of a planetoid. 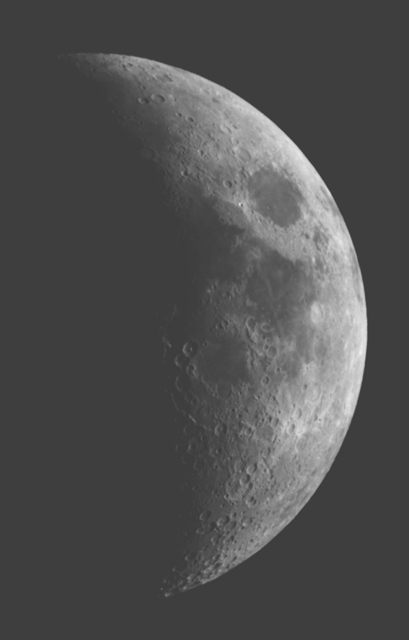 The moon has lost most of its heat and is considered to be geologically inactive at present. The moon has almost no atmosphere and is open to bombardment by solar winds and cosmic rays. Although black & white film was used for this photograph, virtually no color would have shown in a color picture. The mass of the moon is only about 1% of Earth's. Its radius is 27% of Earth's. Its surface gravity is 17% of Earth's. The moon's rotation (once every 27.3 days) is "tidally locked" to its orbit around the Earth, so we always see the same side, although it does appear to wobble a bit. For a brilliant animation of that, see António Cidadão's lunation (you may need to click reload).